The Akron Carnegie Public Library is the result of the enthusiasm of Rev. M. H. Krause and a few other spirited citizens of Akron. Their goal was to provide the area with better community resources and facilities through the establishment of a public library. Prior to 1870, the only known library available to the public was a collection of books that was shelved in a drug store and cared for and loaned out by Milo Bright. The small fee that he received was paid by the township. When Jacob Whittenberger became the trustee of Henry Township, the collection was moved to Millark so that the residents in that part of the township might also enjoy the books. They were placed in the store of E.A. Arnold, a former Henry Township trustee, and he received a small fee for loaning them. In later years there were also some small church and school libraries. In 1912 a petition was circulated with the goal of obtaining a public library building. Various preliminaries necessary for the establishment of a public library and appointing a library board were carried out. The members of the first Board were Estil A. Gast, Mrs. P.L. Ferry, Mrs. M. L. Patterson, Emory L. Scott, Wilber C. Hosman, W. F. Neal, Dessa Sayger and Delno Whitcomb, Township Trustee. 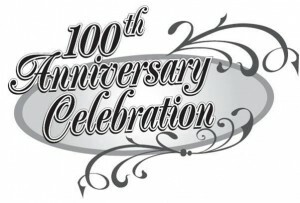 On August 12, 1912, a meeting was called by Rev. 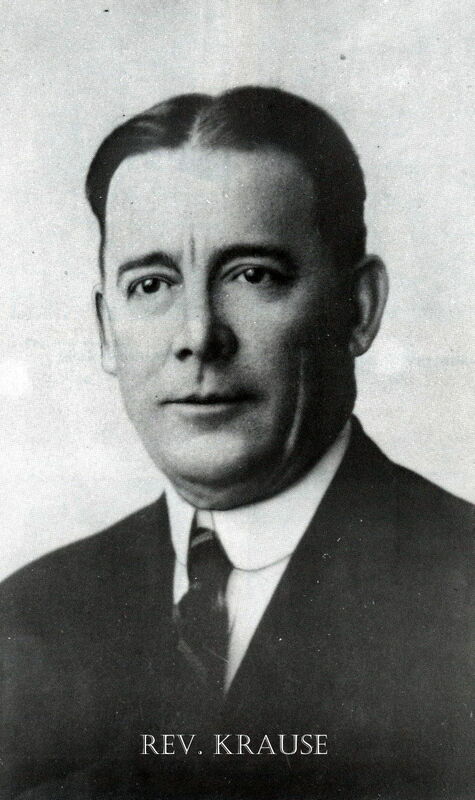 Krause, then pastor of the Akron Methodist Church, who acted as chairman for this meeting and at which time by-laws were adopted, officers elected and committees appointed. 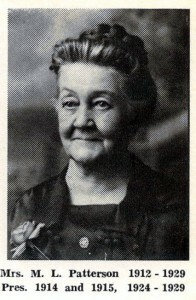 E. A. Gast was elected president, Mrs. P.L. Ferry, vice president and W. C. Hosman, secretary. Dessa Sayger was appointed temporary librarian. At this meeting, a resolution was presented and adopted, extending the free use of library privileges to the residents of Henry Township on the condition that the township levy a tax as provided in the law approved on March 4, 1911. This was later carried out, making the library a township library. It was decided to declare Saturday, August 17th as “Library Shower Day” and when that day arrived, members of the Board went about gathering together books that the townspeople were donating from their private libraries to form the nucleus for a public library. 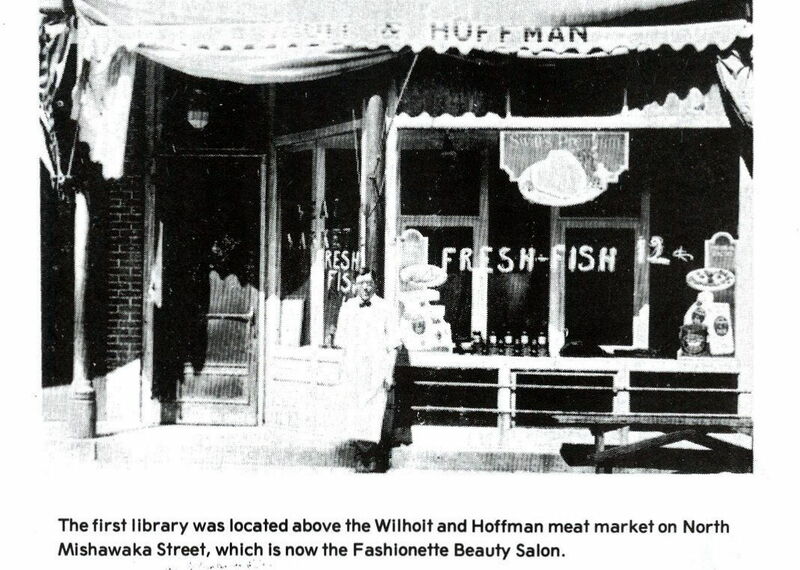 The books were placed on designated shelves in the rooms above the Wilhoit and Hoffman Meat Market. These rooms had formerly been occupied by the local Commercial Club. The board rented them for $4.00 per month and purchased the furniture from the club by paying back rent for a year. Edna Wilhoit was elected assistant librarian and was asked to take active charge of the Library, and in February 1913, was officially made Librarian. On August 19, 1912 the Akron Library with 260 books on its shelves, was opened to the public. The following is the Library’s report for the first month. Early in the year 1913, Rev. Krause began corresponding with the Carnegie Corporation with the goal of securing funds for a library building. A gift of $12,000 was eventually granted, provided that the local board guarantee a sufficient amount each year to support the library. The question of a suitable site for the new building was a matter of earnest consideration. Several properties were available and much enthusiasm was evidenced by various groups of citizens; however the present location was decided upon and accepted by the local board and the Carnegie Corporation. It was purchased from Morrett and Paxton for the sum of $1,500 and presented to the Library Board of Akron by Fletcher Stoner and Daniel Leininger and other interested citizens. On September 22, 1914, plans for the building were accepted and Milo Cutshall was selected as the contractor. In the meantime, it was discovered that the lot was too narrow, so Mrs. M. L. Patterson, then president of the Board, purchased a strip of ground to the west, and donated it to the library. Mrs. Patterson served actively on the Board until her death December 30, 1929. Much credit is due her for her enthusiasm and untiring efforts in helping to establish in this community this splendid educational institution. 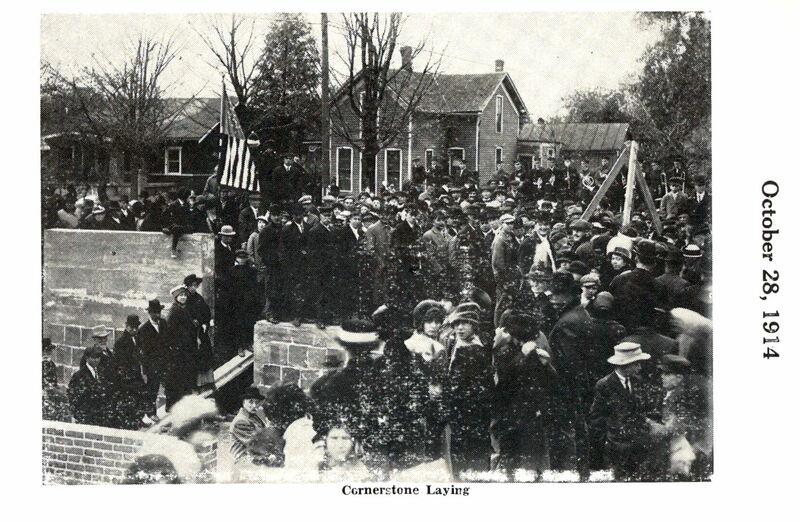 On Wednesday, October 28, 1914, a crowd of 750 to 1,000 people witnessed the laying of the corner stone for the new Carnegie Public Library which was to be built in the near future. A parade preceded the ceremony. There were 275 students and school children participating in the parade to the Library, which started at the foot of the stairway of the old Akron Exchange Bank building and proceeded north on Mishawaka Street to the city limits where the school children met them. They then marched to the Library for the ceremonies which were in the charge of the Masonic Order. The Akron Band led the parade with the G.A.R. Veterans, Modern Woodman, school children and the Masonic Order following. Walter C. Bailey of Peru acted as special Deputy Grand Master by authority from the Grand Lodge. He was assisted by John Orr, Assistant Deputy; Norton Reed, Sr. Warden; and Scott Stinson, Jr. Warden. D.M. Whitcomb was marshal of the day, assisted by L. A. Rickle. Rev. Krause, the organizer of the Library, was present as the guest of honor. He gave the address which was inspiring and helpful. W.C. Hosman, Grand Treasurer, placed some tokens in the stone’s receptacle consisting of a history of the efforts to secure this institution, the role of public school children of Akron, the Akron News, and a program of the day. 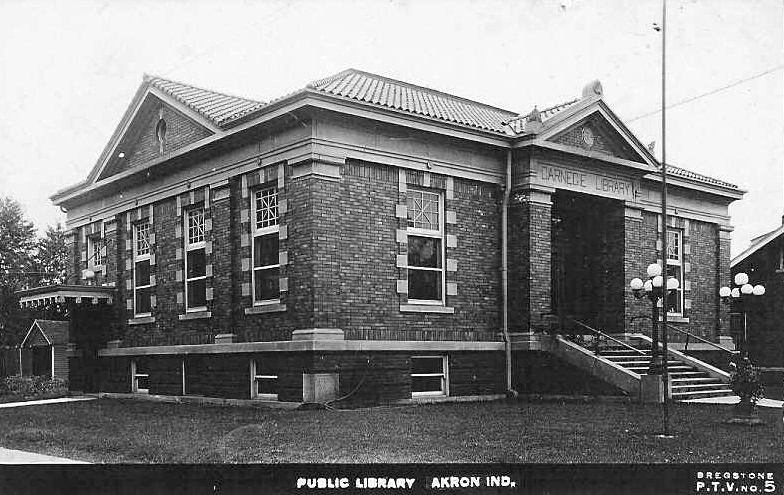 In a little more than a year from the letting of the contract, the building was completed, the grounds graded, the new equipment installed, and on October 21, 1915 the Akron Library moved into the new quarters and became the Akron Carnegie Public Library. The Librarian reported to the board at its first meeting in the new building, 1,306 books and 500 loans during the month; a considerable growth in three years.